This genus is accepted, and its native range is Turkey. Annual. Culms erect; 13-25 cm long. Ligule an eciliate membrane. Inflorescence a panicle. Panicle open. Primary panicle branches whorled at most nodes; sterile at lowest node. Spikelets solitary. Fertile spikelets pedicelled. Spikelets comprising 3-6 fertile florets; with diminished florets at the apex. 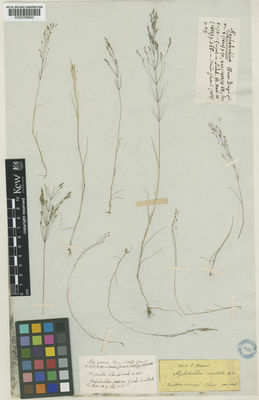 Spikelets oblong; laterally compressed; 2-5.5 mm long; breaking up at maturity; disarticulating below each fertile floret. Rhachilla internodes pubescent. Floret callus pubescent. 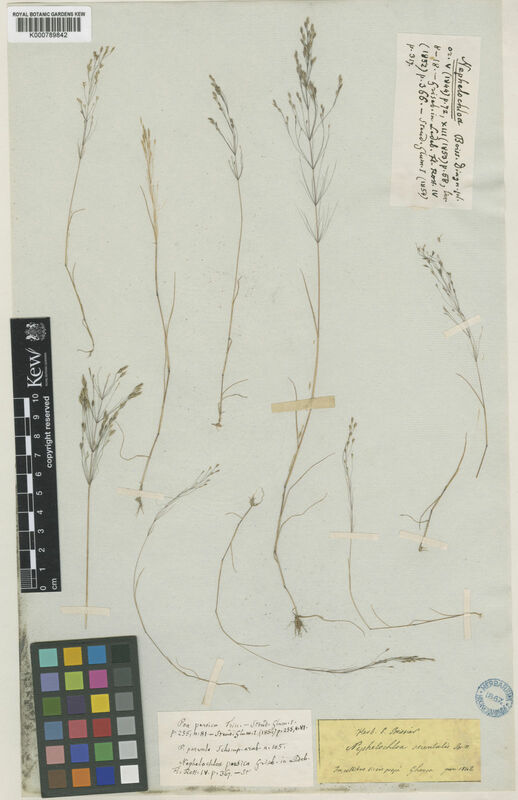 Glumes persistent; shorter than spikelet. Lower glume lanceolate; 1.1 length of upper glume; membranous; without keels; 1 -veined. Lower glume lateral veins absent. Lower glume apex acute. Upper glume ovate; 0.75 length of adjacent fertile lemma; membranous; without keels; 3 -veined. Upper glume apex acute. Fertile lemma elliptic; lanceolate in profile; membranous; much thinner above; without keel; 5 -veined. Lemma apex lobed; 2 -fid; incised 0.2 of lemma length; awned; 1 -awned. Principal lemma awn from a sinus. Palea 0.66 length of lemma. Apical sterile florets resembling fertile though underdeveloped.